Seaside resort made ? ?world famous by the Impressionist painters, Trouville is still very popular among tourists. 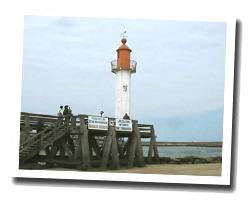 It occupies a pleasant site at the mouth of the Touques river facing Deauville. Many Belle Epoque seaside villas have been preserved. At the seaside you can find a long sandy beach lined by a boardwalk. 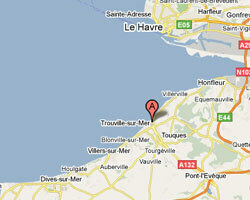 In Trouville enjoy a seaview holiday rental. In a leisure residence located in a Belle Epoque building , on the edge of the beach. Covered and heated swimming pool. view of the harbor of Trouville. In town center, close to shops and "Promenade des Planches". Food available on site. Price from 544 € to 1200 €. Studio flat in a residence overlooking the sea, access to the beach by a footpath. Loggia with outdoor furniture. pétanque and tennis court in the residence. Sheets provided. Price from 450 € to 950 €. Trouville sur mer is a little town 2 km from Deauville. Residence "Le Domaine des étoiles" is 1.5 km from the centre of Trouville, on the top of a hill, 750 m from the sea. 2 rooms Apartment 70 m2 on the 2nd floor in the "Les Flots residence". Balcony with outdoor furniture. Nice view of the sea and the beach. Direct access to the sandy beach. Apartment 1 rooms 37m2. Close to the beach. Located on the sea front in the city centre, Trouville Palace offers a studio apartment which is decorated in a marine style. Sea view, LCD TV and equipped kitchen. High-end Apartment on the 1st floor of a modern villa (independent entrance). 3 rooms Apartment 54 m2 on the 2nd floor in the "Le Parc Cordier residence". Balcony with outdoor furniture. View of the sea.